Today, I shall be reviewing Ravi Subramanian's latest book - The Bestseller She Wrote. Earlier this month, I received an autographed copy of the romance novel. You can also read my review of God is a Gamer by the same author. 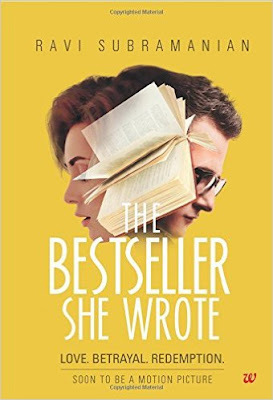 'The Bestseller She Wrote' is not what you would ordinarily expect from Ravi Subramanian - the writer whose claim to fame is a series of successful financial thrillers. He writes his first romance novel, but the premise is still well within his comfort zone - writing and banking. The story is explores a phase in the life of Aditya Kapoor, a bestselling author who also holds a senior position at a bank. He is handsome, charismatic and very lucky to have an understanding and loving wife in Maya - his B-school sweetheart. Theirs is a happy family with a toddler in the frame. Aditya meets Shreya, a topper at IIM-Bangalore when he is invited to his alma mater to address the students and promote his latest thriller. Shreya is an attractive and intelligent girl who is fiercely ambitious at the same time. She pines to become a bestselling author of Aditya's stature. What in the beginning seems like an innocuous acquaintance, later turns into an adulterous affair. The plot is a result of coincidence and also deliberate scheming. The book explores the delicate and dangerous world of adultery - how it starts, what goes on in the mind of an adulterer, if conscience and guilt make their presence felt, what happens when the cat is out of the bag, and if cheating can ever be forgiven. At the same time, the setting takes the readers through the nuances of getting one's book published and promoted. There are also the usual office scenes at the bank and the sundry issues you would expect. The twist in the story is the sudden importance attributed to Maya and what happens to her. This is what keeps the book from going down the done-to-death route of a regular romance novel. Perhaps I was expecting better stuff from the author, given my past experience with his writing. This is why the book disappoints me. Many cliches have been fortified in the book. Also, Subramanian seems to have made as little use of imagination as possible. Large parts of his story seem to mimic the life of Chetan Bhagat or perhaps his own. He casually indulges in name dropping - Ashwin Sanghi, Blogadda, HT Brunch and even Anurag Kashyap! The references seem jarring and distract you from the story as you wonder why he is irritating you with unnecessary third-party promotion. The novel is not too bad though. It is fast paced and interesting enough to be carried along on a train journey. The interlacing of a certain global crisis is what kept me hooked to the book when my attention was wavering.